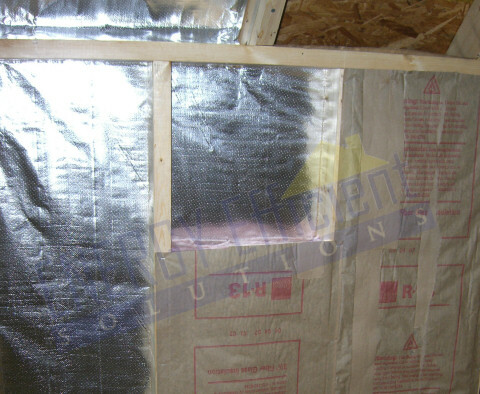 Radiant Barrier wall sheathing can be attached to the attic (exterior) side of a knee wall to cut down on radiant heat gain or heat loss in the winter. It is recommended that insulation be encapsulated on all six sides with a rigid air barrier like sheathing or foam board. If possible install sheathing on the attic side first and then cover with radiant barrier. 2. If there is no air barrier installed on the attic side, consider adding sheathing or foam board to encapsulate the insulation on all six sides. 3. Unroll the Radiant Barrier sheathing and staple to the exterior side of the wall facing the attic, overlapping each run by about 2 inches. 4. You should tape the seams and secure the edges to the framing to create a backside air barrier. This will help to reduce air infiltration. This image was taken from the interior prior to radiant barrier wall installation of sheet rock. If your local climate or building code calls for an interior vapor barrier, Non Perforated Radiant Barrier can be used as a vapor / radon barrier. Radiant barrier in walls will reduce moisture inside the house from passing through into mass insulation. 1. You must use non-perforated (ARMA FOIL-VB™) material for this job. 2. Unroll the Radiant Barrier and staple to the interior side of the wall studs and insulation. 3. Overlap each run by about 2 inches. 4. To create a true vapor barrier, you must tape all seams and penetrations.